Hand held refractometers are one of the most popular analytical devices. They are used in many places - like in wine growing and wine making, both by professionals and amateurs, in beer brewing, in garages to check battery electrolyte and cooling liquid quality, and so on. They are very simple in use and give almost instant result, without tedious and costly laboratory procedures to follow. Hand held refractometers are in most cases critical angle refractometers, not much different from the immersion refractometer (which - by itself - is a variant of Abbé refractometer). Hand held refractometer - working principle. Note that real devices usually contain additional optical elements, like lenses and optical wedges, that help to obtain sharp shadow boundary. Instead of having an illuminating prism, hand held reflractometers have an illuminator flap which produces a diffused light at a grazing angle and helps to keep the sample in place. Light passes through the sample, enters the measuring prism and possibly other lenses, and finally falls on the measuring scale where it can be read. Depending on the reason for using the refractometer, its scale can be graduated in Brix degrees, percentage of alcohol or glycol percentage, etc. To take care of temperature differences, simple hand held refractometers have to be either calibrated before taking measurements (using calibration screw and distilled water), or the result have to be converted using a temperature corrections table (which requires separate temperature measurement). However, many refractometers have built in temperature compensation - either scale or additional optical wedge are mounted on the bimetallic strip, which bends when the temperature changes, compensating for changes of refractive index. That makes them much easier to use. Measurement technique is very simple. 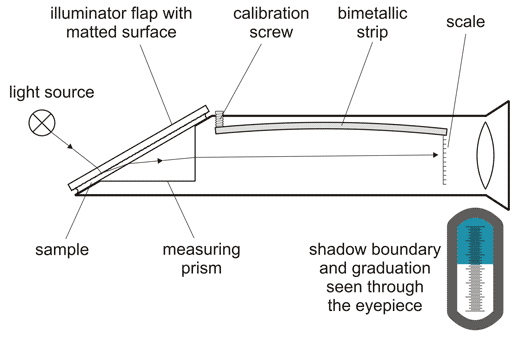 First, you open the illuminator flap (it is connected to the device by a small hinge) and put a sample on the measurement prism surface. To put the sample on th prism you can use a pipette, but when taking measurements in the field even squeezing a few drops of juice from the fruit will do. After the flap is closed, you look through the eyepiece, and read result from the scale. That's all. For easier reading it may be necessary to place the refractometer in the direction of some light source (like Sun or lamp), but during a day ambient light is usually strong enough. After finishing measurement, you should wipe dry prism and flap with a clean, soft cloth. This site is in construction. More to come. Page was last modified on April 10 2012, 11:18:13.